In these intensely female, lively luscious songs it's Colette meets Beyonce meets Lil Mama meets Cixous and in comes Kristeva meets Molly Bendall meets Gail Wronsky, and therefore streams continual surprise—eros kisses big bad boogie man theory and "word as noose" slang jumpstarts high-flown lingo and it's all so playful and yet deadly serious—how these poems issue from one urgent, collective, Medusa-like mouth, one it's high time is heard. 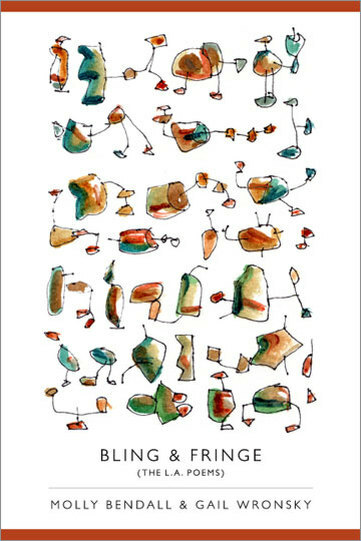 Dressed up, sequined sequence of syllables and words working the poem's runway, Molly Bendall and Gail Wronsky's poems give us alluring I-candy, word-assemblages beckoning for some time with our eyes and ears. Poems dressed up to a-muse. Parts and pieces on display, accessorizing and exposing the poem's attractions. Name-dropping; mixing and matching; reading is touching.